What a crazy past few weeks! I'm finally able to sit down and catch up on my blog posts after taking a break. Ever since the holidays and even into New Year's Eve, I've been creating content over on my Instagram page and neglecting my blog page. However, with a new year comes new resolutions to keep blogging and to figure out a schedule where I can upload quality content on a regular basis. I want to offer some more personal posts divulging my everyday life, too. I love getting dressed up and looking super fancy for fun photoshoots, but there are other areas of my life that will need attention, too. It's so interesting to think about the fact that I've been blogging for over three years now! 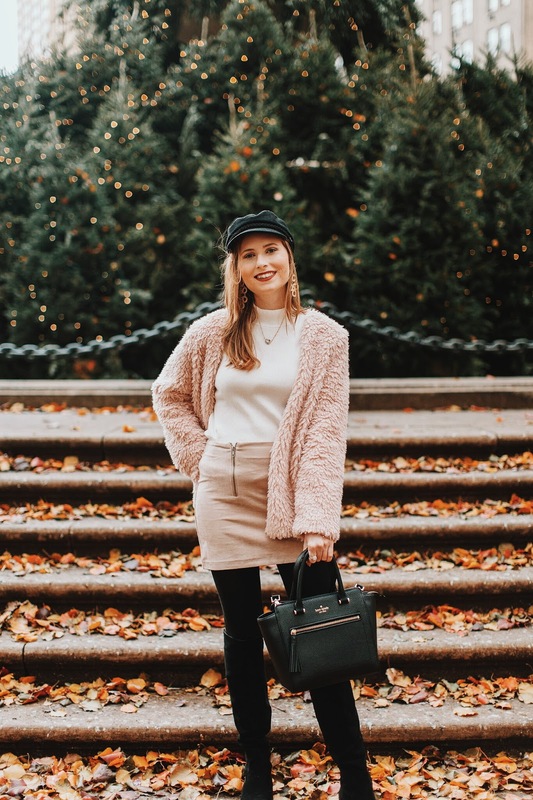 My blogging has changed and morphed into a place where I can share my outfit details, skin care routines, personal goals in my career, and travel experiences for you to explore with me. For now, let's dive into this outfit look, straight from my NYC vacation. I'm wearing the two TOGETHER because why not. I adore this FUZZY COAT from Nordstrom. It's also marked down 40% off. Another pick that looks similar is THIS TEDDY BEAR COAT. I mean who doesn't want to be a comfy as a bear, haha. Baker boy hats are just so cool. THIS HAT is only $25, so you can experiment with the trend on a budget, my friends. I love the 70s vibes associated with the baker boy hats. I just need to wear my baker boy hat everywhere. I already wear it with most outfits during the day, too. Let me know the trends you are loving in the comments! As always, everything is linked in the widget below! Just click the image to shop.